I finished the Nurgle sorceror and re-based a Tzeentch sorceror to give me a few options in army selection. I sometimes use Slaanesh magic, in which case I take this Rackham model. Eventually I will paint another GW model to replace this one, which will also have the option of riding a magnetised chariot. That will be sometime in the future though. I generally take two sorcerors in a 2000 point army, the Tzeentch sorceror takes a power familiar to help with the high casting level of his spells, while the Nurgle sorceror tends to take a spell familiar to give me a little extra choice. Next on the agenda will be some mounted troops, either marauder horsemen or some Nurgle knights. I was going to paint the exalted hero on the daemonic steed next, but after the Khorne warriors dragging on I wanted something a bit quicker to achieve. I have been using an old plaguebearer model as a proxy for my Nurgle sorceror, so I searched through my lead mountain for something more suitable. This old chaos champion, with a few plastic bits (mainly dryad branches), is the result. I even found a little familiar to use. This is a test model in a way, if the end result is good I will be doing something similar on the chaos knights. The inspiration for the antlers comes from the original concept work for Nurgle afflictions. 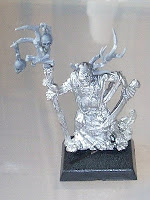 Antlers and horns were freely handed out by Nurgle back in the 1980's, as you can see here. When this model is painted up I will have three sorcerors on foot, but more on that next time. The Khorne warriors are finally finished, though they took a bit longer than I anticipated. I am just glad to have them finished, I might at a future date decorate the banner with a few more heads. I also need to dust the movement tray with a bit of snow. The cloaks were the biggest problem, I couldn't decide if they should be red, black or brown. In the end I thought a polar bear (off white) fur helped to lift the model a little, a dark brown against dark red might have been too dark. The fur also helps tie in with the snow theme. There's a little snow and blood at the bottom of the cloaks, as the warriors have waded through the blood of their enemies, but it's hard to see on this picture. I will get some close-ups taken in the next few days. Here's my chaos army general, an exalted hero on daemon steed. The head is from the Lord on Juggernaut set, while the plastic bits are from the knights set - the shield will obviously be attached to the arm when it's painted. These minor changes help to improve the already impressive Archaon model. I will probably paint him up after the Khorne warriors, which are progressing well. The spawn I had planned to paint in this phase of three has been pushed back to the next phase. That last trio breaks my rule of infantry-special-fast per phase, but it fits my current army. Suprisingly, I don't seem too far away from having a 2000 point fully painted army! I do have ideas for more characters, more units, but for the time being I will be happy to have these as a starting point. Not only is the painting go well, but the gaming seems to be pretty decent too. From my first frustrations with the army I now seem to handle the problems of speed better and am having some surprising victories - my dwarfs never seem to beat lizardmen or vampire counts, my last two vanquished foe. The lack of chaos warriors in the army does concern me a little, it doesn't seem quite right to have just one unit of chaos warriors and one unit of knights, but I'm enjoying the games so can live with that little problem. Just a quick update post to show the little bit of work I did today. The unit was completed a few months ago, just the banner top remained to do. I was in two minds about whether I should tie the unit to Khorne or leave it unmarked. In the end I realised I could use a small magnet to hold the the banner in place, thus allowing me to use a different configuration if I feel the urge to change in the future. The removable top also makes it a bit easier to transport. The chaos warband at the start of the month of August. Not bad considering I started painting it only a few weeks ago (and I have just had a week's holiday which included no hobby time at all). It's around 250 points, but that will be easily doubled when I add the next unit, chaos warriors are very expensive points wise. My plan is to paint the army in groups of three, each group comprising an infantry unit, a special or rare model and a fast unit of some description. So, phase 1 is complete with the Slaanesh marauders (infantry), the Nurgle spawn (special) and the hounds (fast). Phase 2 will comprise a unit of chaos warriors, another spawn and some marauder horsemen. I also have a couple of sorcerors that I have already painted to add to the army, I just need to re-base them. I might also make a pair of familiars to go with them. Still feeling good about the army and keen to get it painted, which is unusual for me. I just hope the enthusiasm remains before the next distraction comes along.